In the Shattered Glass universe, the Decepticons fight to save Earth from being destroyed by the ultimate army of destruction...Optimus Prime and the Autobots! Bio: In the Shattered Glass universe, Cybertron is a dark and different place. 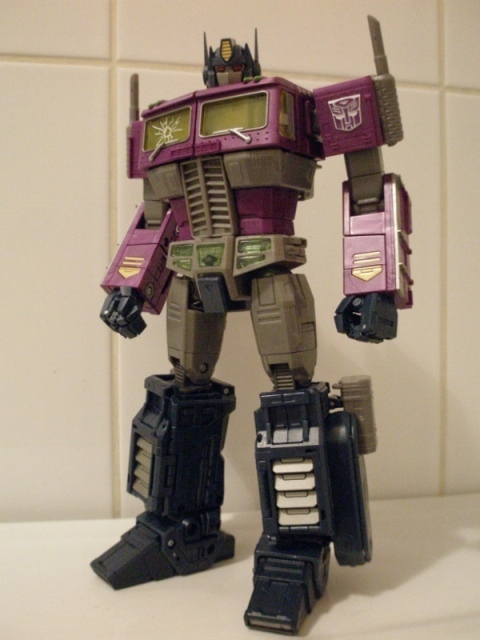 Once just a simple Librarian named Optronix, the deranged and dangerous warrior now known as Optimus Prime plotted and schemed his way to power on Cybertron, forming a loyal and lethal band of followers known as the Autobots. Now, Optimus Prime has set his sights on conquering the universe. The first step in his plan: harvest Earth's precious resources and destroy anyone standing in his way. Unless the heroic defender Megatron and his scrappy, rebel band of Decepticons can find a way to stop him, Optimus Prime will continue his fight till all are gone! Released to little or no fanfare towards the end of 2016, this new version of the celebrated MP-10 Optimus Prime mould was a pleasant surprise. I'm not entirely sure what the reason is for this, but its a fair bet its something to do with the new movie trailer which shows an apparently 'evil' Optimus blasting his way through his former comrades. As well as making the small clique of FubPub contributors squeal with delight, this was also a timely release for me, as I'd belatedly decidied 'd rather like an MP Optimus Prime toy. All versions of which are now stupid expensive on the aftemarket, particularly the rather awesome MP10B 'Nemesis Prime' (another evil Optimus). Either way, its nice to see Hasbro coming up with some cracking ideas for variants and exclusives, rather than losing out on fanboy dollars to Takara who are never more than five minutes away from a novel repaint. This version of Optimus Prime hails from an alternate dimension where, in time honoured sci-fi tradition, the good guys from 'our' universe are all evil and the bad guys are good. 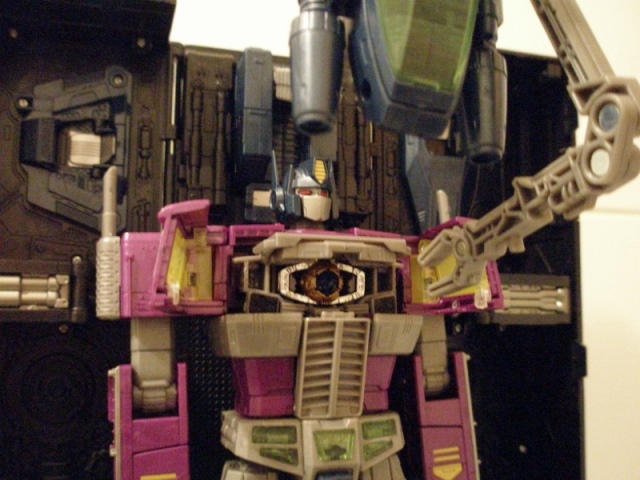 Its a clich�, but for the short time I was a member of the Transformers Collector's Club, during 2008 this was the strip running in the magazine, and it was actually a tremendous amount of fun (particularly in its portrayal of Rodimus, who made a better Starscream than, well, Starscream). 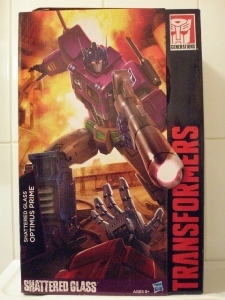 Some Club exclusive and BotCon figures (including a pricy boxed set) emerged shortly after, based on then-current Classics moulds and any passable Cybertron moulds. The theme was revisited again in 2012, with a further run of collector baubles. Robot Mode: A seriously impressive rendition of the iconic Autobot leader, there isn't anything much to do but just stare in slack-jawed awe at how brilliant this toy is. As with the other early revitalised Masterpiece figures, this strikes the perfect balance between cartoon model sheet and the original toy. There's none of the smoothed out blandness that's come to characterise some of the later releases � great for a 'toon accruate toy (if you must), but low on visual punch. We'll start at the top and work our way down, in reverence and awe. The headsculpt is spot on, with a nice vented mohawk and some crisp sharp angles to the anntenae and them bits that go around the sides of the head. I like the vents added to the 'ears', which stop them being plain old circles. The faceplate is suitably huge, filling over half his face and I like the red eyes, which make him look ...angry. The chest and shoulders are nice and broad without over-doing it, the windows making for perfectly proportioned pecs and the grill doing good work as abs. The neat boxy shoulders give way to some mighty railed and riveted foreams, which lead to some expressive and nicely sculpted hands. The waist and legs continue the muscular look and pack in some neat panel lines and vents. The inside of the lower leg also reveals some nice moulded detail featuring some pistons and other machine-y bits and bobs. The good work done making sure Optimus looks impressive from the front also extends to the rear, with plenty more moulded detail and points of interest � I especially like the headlamps of the alt-mode which frame the backpack. A small detail, but it pleases me and hints at an impressive transformation. Even the soles of his feet look good! So impressive is the level of detail that even the highly visible screw holes don't detract from the majesty of this guy. The other obvious thing to talk about is the muted and suitably evil livery. Shattered Glass Prime eschews the patriotic red and blue for a cracking shade of purple, some navy blues and some gunmetal gray to ramp up the sinister. Frankly, he couldn't look more evil unless he came with a top hat, cane and a moustache that he could twirl. In addition to this dark palette he has a lovely sickly lime green colour on his window chest, undies and some gold splashed on those arrow things on his forearms. He lacks the chrome bling of the other MP versions, but at least I don't have to worry about chrome wear from playing with him, so I'm counting that as a plus. All of this awesome would be for naught if he couldn't strike a pose, and here Optimus excels. There's joints all over the place to make the maximum amount of cool poses � running, jumping, threatening and break-dancing, so give you all you need. Only the pointy fingers on the hands are a bit of a nightmare (the other fingers are all hinged on one joint) � to give Optimus trigger-finger, a second joint has been added, which is only a clip, and it could really have been done with being pinned to stop half his finger popping off. You're best trying to move the finger from the first pinned joint, but its an uncommonly stuff joint (at least on my version), so take care when handling. In terms of weapons, Optimus comes with his signature rifle, which can be folded up and housed in his back-pack. It looks good, although having to fold up and incorporate a spring-loaded 'unravelling' feature does mean it does feel a bit wibbly. I appreciate the function though. 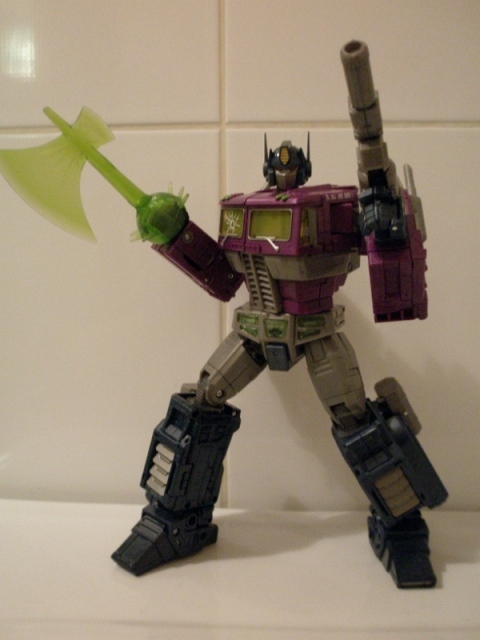 My favourite is the big lime green Energon Axe, which plugs over his fist. This uncommonly brutal melee weapon seems right at home on a ratbag version of the Autobot leader and my version doesn't leave robot mode without it. 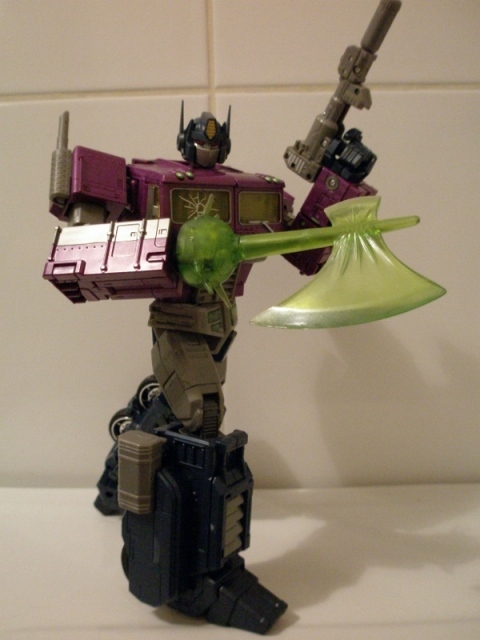 Robot Mode: Shattered Glass Optimus also comes with his trailer which is cool and makes good on the promise of his 'fearsome combat deck' that was missing from the previous toy iterations. Next to the main robot, the trailer has always felt a bit of a side-show and, to be honest, its the same here. Whilst the trailer drone features similar functionality as the original Diaclone toy (opening cockpit, articulated arm and rotating radar dish), lacking any missile launching capability and Roller, it does feel very much like an oversized accessory for Optimus himself. Its arguably at its best in its 'shower cubicle' configuration (which it also comes packaged in). Still, the moulded detail is of an impressively high standard and the splashes of silver paint used to pick out some key details are welcome and of course, like the Generation 2 toy, the thing looks magnificent in black. 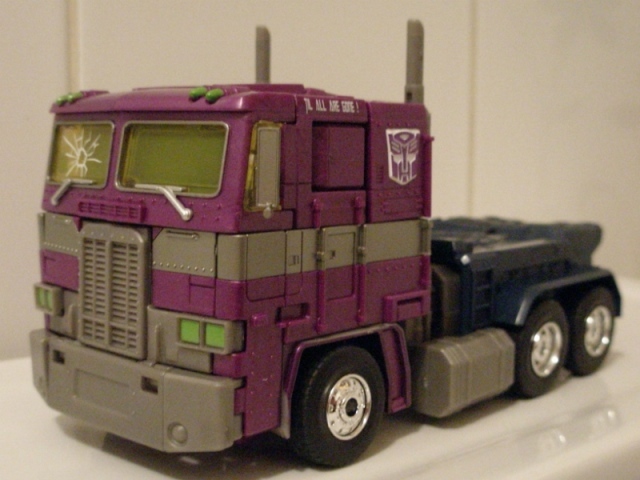 Alternate Mode: The thunderous looking tractor-trailer looks like something straight out of Duel. Or Generation 2. Sorry, but I can't help but compare this to my beloved G2 Optimus (especially as it looks like misprint in the old Titan trades). It looks incredible. 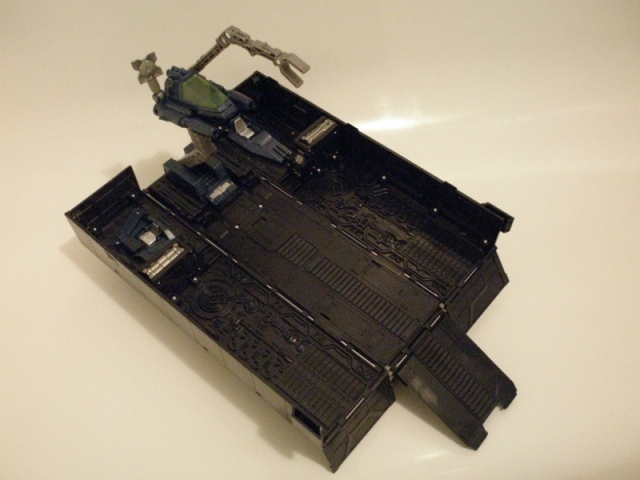 The rails, rivets, panel lines and overall level of detail packed into this version match the original Diaclone toy and build on that level of real world detail. There are actual proper headlights here, which are picked out in a slimy lime green, as are the small lights above the cab. The fold out wing mirrors are a nice touch, the smokestacks haven't been nobbled in some ridiculous 'health and safety' measure and the purple looks lovely. If one were being picky, its here that the use of gun metal grey on the grill, fuel tanks and front bumper that do rob the alt mode of the same sort of 'wow' factor as the original MP-10 Optimus Prime. I do wonder if the chrome hubs should have been done out in the same dark hue, if only for consistency. 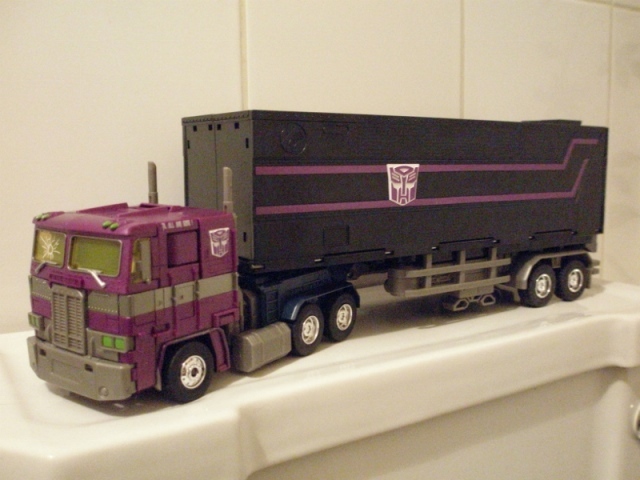 The trailer looks superb in black, with some nice purple striping which matches the cab, and the moulded Autobot sigils are neat too. If there is one big drawback to the alt mode, its that Optimus isn't quite as manouverable as his 1980s counterpart in this mode, only being bale to corner at a 45 degree angle. This doesn't stop him being great fun to play with in this mode, and I like the additional feature of him being able to cart one of his fellow warriors around in his trailer (here's hoping for at least one Shattered Glass repaint of one of the MP carbots).